Amethyst is the the most coveted member of the quartz family. It can be found in shades ranging from a very deep royal purple with hints of red, to a pale pastel lilac with subtle undertones of blue. The pale colors are sometimes called "Rose de France" and are often seen set in Victorian jewelry. The amethyst owes its fabled color to trace amounts of manganese and iron. Its purple color made it a stone of royalty for many thousands of years and is seen in the British Crown Jewels. It was a favorite gem for Catherine the Great and considered sacred to Buddha in Tibet, where rosaries are often fashioned from it. Amethyst has been successfully synthesized in the lab, so buyers need to be sure their source is qualified to separate natural from lab grown material. Amethyst has been fashioned into gemstones and ornamental objects for thousands of years. 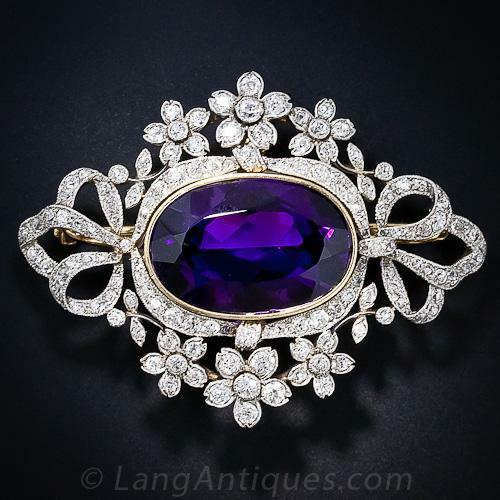 Egyptian soldiers wore amethyst to remain calm during battle. In both ancient Persia and Peru it was believed that amethyst, carved with the symbol of the sun warded off witchcraft. The name amethyst is derived from the Greek "amethystos" meaning "not drunken". It was supposed by the early Greeks that drinking wine from a chalice made of amethyst, or placing an amethyst under the tongue, would enable one to drink profusely without getting dunk. Leonardo Da Vinci wrote that amethyst was able to dissipate evil thoughts and quicken the intelligence. Amethyst was thought to encourage celibacy and therefore important in the embellishment of Catholic and other churches in the Middle Ages. It was deemed the stone of bishops who still often wear amethyst rings today. The astrological signs of amethyst are Pisces, Virgo, Aquarius and Capricorn. Amethyst is the birthstone for February. Amethyst is also the symbolic gem for the Seventeenth wedding anniversary. Amethyst has always been linked to the thinking process, ensuring clarity of vision and emotional stability. It is a meditative and calming stone. Amethysts have been attributed with the ability to provide a sedative energy fostering calm, balance, patience, and peace. "New Age" metaphysicians still believe in amethyst's powers to rid addictions and compulsive behaviors of all kinds.